Mel Gratton and Steve Ehler, Galena, Ill. area farmers, say no till farming takes commitment, but builds soil fertility, eliminates compaction, and smooths unevenness in fields. 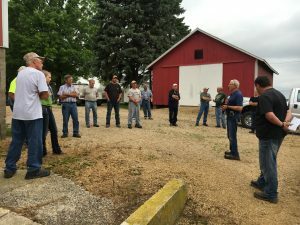 On a rainy June evening in Galena, a group of Jo Daviess farmers gathered on Mel Gratton’s farm to discuss no till practices. Mel’s family farm is fourth generation and they have been practicing no till for over 25 years. Joining Mel is Steve Ehler, another farmer in Galena who began no tilling in 1993. They both have had successes and failures with the practice, but overall see the widespread benefit of it. Throughout their presentation they offer vast amounts of excellent advice and reasons for no till, as well as sharing their own journey with the practice. Mel and Steve’s first point of discussion was for those doing no till for the first time. Steve, the expert on machinery, made the point of making sure you have good blades that are heavy and sharp. Mel went on to list that on the farm you need to build up fertility, eliminate compaction and smooth unevenness. He also stressed the importance of committing to the process, because you will not see results right away. It takes until about the 3-4 year to see changes. He also described getting into the “right thinking”; he explained you need to believe it will be successful so that it will be. Finally, he shared being selective in your selection of crops. Choosing what is best for your farm is very important. There are many important reasons for no till that Steve and Mel went over. The first and foremost being conservation and stewardship. Another important aspect of no till is erosion control. This practice also helps save soil, water, and nutrients. There are major economic benefits from savings on machines and fuel. Unfortunately there are a few disadvantages to the no till practice. A farmer trying this must have a lot of patience, as mentioned previously to see results takes a few years. Some technical challenges include that weed control is chemical dependent and the soil is colder in the spring. Arguably the biggest challenge is the change in thinking that is required for becoming a no till farmer. However, Mel and Steve made it very clear that the benefits far outweigh the limited challenges that come with no till farming. Mel wrapped up the discussion with a strong point on climate change. He insisted regardless of what you believe, things are changing and something must be done about it. He explained if we don’t start doing things differently there wouldn’t be farms left to work on. No till farming is an undeniable way to make a positive impact on the environment. The League of Women Voters of Jo Daviess County’s design proposal for continuous monitoring on the Galena River has been awarded a $10,000 prize. The proposal was submitted in response to a “Nutrient Sensor Action Challenge” posted by the United States Environmental Protection Agency (USEPA) in partnership with the United States Geological Survey (USGS), the National Oceanic and Atmospheric Association (NOAA), Alliance for Coastal Technologies (ACT), United States Department of Agriculture (USDA), and the National Institute of Standards and Technology (NIST). 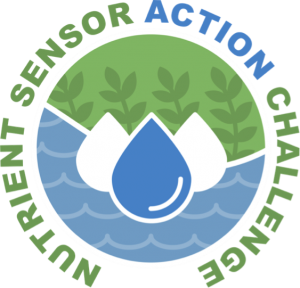 The Nutrient Sensor Action Challenge is a technology-accelerating water quality challenge to demonstrate how nutrient sensors can be used by states and local communities to help manage nutrient pollution. Nutrient pollution, one of our most widespread, costly and challenging environmental problems, is caused by excess nitrogen and phosphorus in water. Too much nitrogen and phosphorus in the water causes algae to grow faster than ecosystems can handle. This growth causes major environmental damage as well as serious health problems in people and animals. The League of Women Voters’ structure and approach allow members to play an instrumental role in efforts to address complex issues. Organized at the local, state, regional, and national levels, League efforts and resources can be scaled up and down as appropriate. With a formal process for studying issues important to voters and coming to consensus before taking action, the League has become widely respected for its non-partisan, fact-based, educational approach. 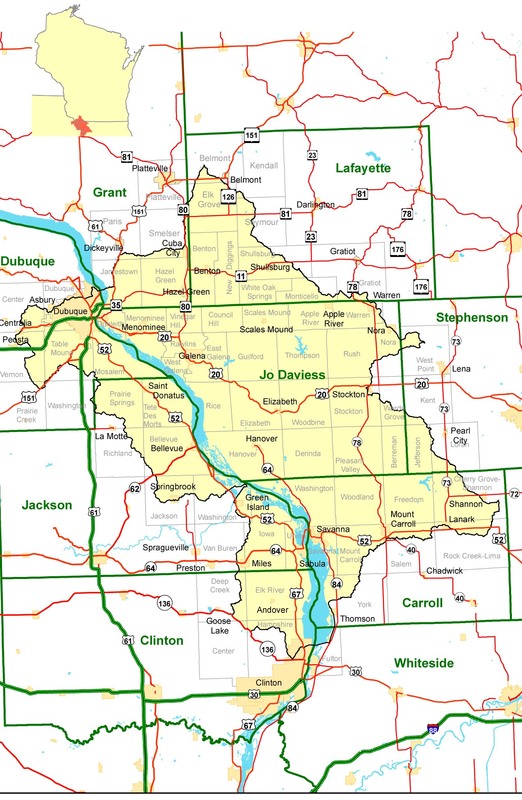 The League of Women Voters of Jo Daviess County is creating a model that showcases how “The League Way” is working with residents in Jo Daviess County on the locally important and globally critical topic of water resource management. The local chapter of the League in Jo Daviess County, Illinois has been actively seeking water quality data to increase our local knowledge. The ultimate goal is to achieve science-based stewardship of the water resources in our area. Working with scientists from the Illinois State Geological and Water Surveys, a project was designed for deploying two low-cost sensors, one each at the top and bottom of the Lower Galena River subwatershed to gather continuous data on nitrate levels. 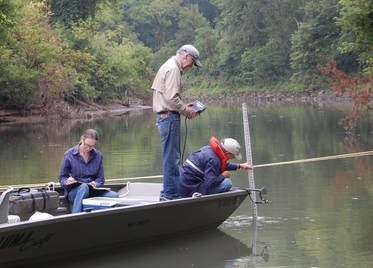 The technical review panel for the Sensor Challenge determined that the League’s submission could help better inform decision-making for nutrient reduction in our nation’s waterways. The Challenge judges explained that the prize money could be used for anything at all – including, perhaps a trip to Hawaii, but the League has decided, instead, to dedicate the $10,000 to ongoing efforts to effectively manage water resources in Jo Daviess County. Working with scientists from the Illinois Geological and Water Surveys, samples of the Galena River were collected to analyze for sources of nitrogen. • Following a divisive multi-year (2007-10) controversy (based in large measure on differing opinions on potential contamination of groundwater in the karst aquifer) over the siting of a large confined dairy feeding operation, the LWV-JDC organized a public forum bringing in representatives from the Illinois EPA, the Illinois Department of Agriculture, and others to provide information on the siting process and the pressures impacting the dairy industry. • In 2013, the LWV-JDC organized a public forum entitled “The Land and Water Beneath Us” at which scientists from the Illinois State Geological and Water Surveys shared information they currently had on the hydrogeology of the area, explained what scientific information was lacking, and proposed ways to obtain new information. • From 2014-16, local League members organized and facilitated a countywide water resource management planning project. A diverse set of stakeholders were brought to the table to learn together about the area’s water resources, and to agree on a set of facts so that we could develop goals and objectives to maintain our resources effectively. We agreed to use evidence-based decision making to achieve science-based stewardship. We presented to and surveyed every local governing board (county, municipal, township, and resort community) at the start and at the finish of our planning effort. An Illinois EPA approved Quality Assurance Project Plan was completed for the survey effort. To date, the county, 9 municipalities, 5 townships and a resort community have approved this plan. This project, a 100% volunteer effort, received the “Community Engagement Award” at the 2016 National League Convention. • One of the county plan action items was a focused sub-watershed plan to identify specific projects for water resource management. The sub-watershed surrounding the City of Galena was selected, and – using private donations and volunteer time for match – a 2016 $38,000 Illinois EPA Grant was obtained to cover technical assistance, printing costs, and planning consultant expenses for this 2-year planning project. • The LWV-JDC initiated the formation of the Upper Mississippi River Region Inter-League Organization to work on water resource management at a larger scale. This 4-state entity was incorporated with 60 local League chapters participating in October, 2016. • The League used private donations and a grant from the Galena Lions Club to purchase copies of “The Watershed Game” created by the University of Minnesota Extension, and to offer two training days for those wishing to be able to facilitate the game for local governing boards, service organizations, students, etc. Forty-seven individuals, including 30 in Jo Daviess County, were trained in October, 2016, and a second training scheduled for September, 2017, is funded with a grant from 1 Mississippi. • The LWV-JDC partnered with the Galena Rotary Club to put on a day-long conference in January, 2017, entitled “Water: We’re All in the Same Boat” – bringing in speakers to share information about current water management issues and approaches, and providing breakout sessions with presenters sharing information about local projects. The League and Rotary is actively working to expand this organizational partnership for conferences and educational programming in other areas of the Upper Mississippi River Region. • Using private donations and volunteer time as match, a 2016 U.S. Fish & Wildlife Service (USFWS) grant for $7,000 was obtained to conduct spring sampling with scientists from the Illinois State Geological and Water Surveys. This sampling will help establish baseline water chemistry in the area’s shallow aquifer for future reference. The project also included the development of a model karst feature database to store information on springs, sinkholes and bedrock fractures to be used both locally and by the USFWS. 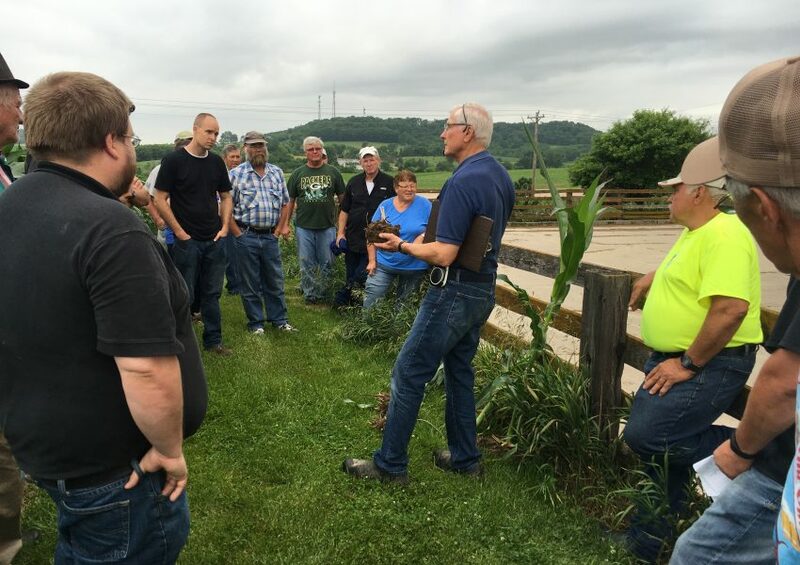 • Participated in the USFWS Fishers & Farmers Leadership Network workshops in 2016, and continue involvement – working with others in the network and maintaining a Leadership Network website for the Apple-Plum watershed. • Using the Galena Watershed work, state EPA grant funds, along with financial contributions from the City of Galena, a local fertilizer plant, local not-for profits and private donors for match, a 2017 U.S. 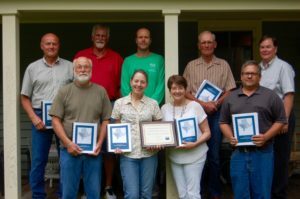 Fish & Wildlife Fishers & Farmers grant for $20,000 was obtained to support the formation of a farmer-led group in the Galena Watershed. Workshops, field days, river water sampling, and soil nitrate testing will be conducted.